Would you be brave enough to ride down a hill inside a giant, see-through zorb ball? 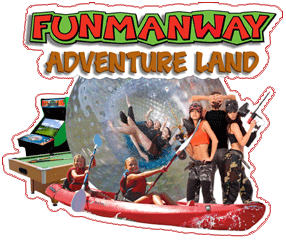 Then come to Fun Man Way and experience zorbing in the only cornered globe riding track in Europe. This track runs at over 265 meters and an even steeper straight track at 245meters! You can ride these tracks either harnessed into the globe ball or chilled inside in a zorb filled with 12 gallons of spring water, rolling and sliding around each other the whole way down the back of the Yewtree Hill. Fun Man Way has spent the last 2 years perfecting and landscaping their tracks to make them perfectly safe for everyone to enjoy. The company promises you that if you do make it down here, you can back out at any time with a guaranteed full refund so long as you’re not half way down by the time you change your mind! After zorbing, you can then chill out by taking a kayak down the Bandon River or by enjoy a game of paintballing at Mount Gunnery. To feel the ground beneath your feet again, you can enjoy the West Cork landscape by taking a stroll round their 21-acre property and nearby woods. For further info and for reservations, please contact James of Fun Man Way using the details below.